Sunflowers (Helianthus annuus cvs.) don't just come in yellow anymore. The introduction of new cultivars offers gardeners a variety of options for color, flower shape and mature plant size, including several with purple petals. All cultivars, however, have similar growing requirements. 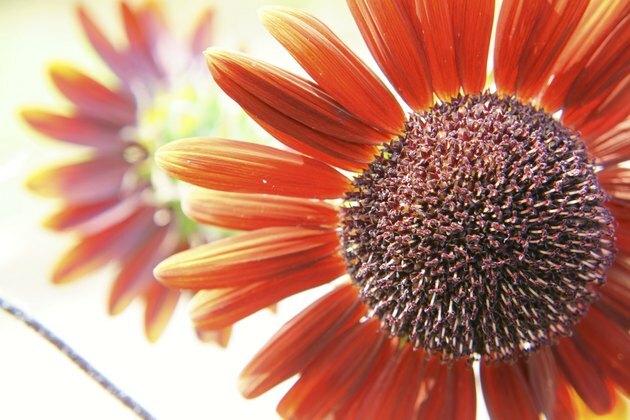 About 50 species of sunflowers exist in the Helianthus genus. Thirty-eight of these are perennial, but annual sunflowers are the ones most often grown in the home garden. Sunflower colors range in hue from the traditional golds and yellows, to white, rose, red, purplish burgundy and chocolate brown. Annual sunflower varieties with dark burgundy-purple petals include "Chianti" and "Claret." The variety "Ruby Moon" offers two-tone burgundy petals with creamy white tips. Other offers in the purple range are "Chocolate Gold," "Ms. Mars," "Floristan," "Chocolate Cherry" and "Moulin Rouge." Seeds can be found for hybrid purple blooms in home improvement stores, garden centers and online. As their name suggests, sunflowers require full sun. Ideally, plant sunflowers in locations with six to eight hours of direct sunlight every day. Sunflowers thrive in fertile, well-drained soil. Amend soils that drain poorly or lack sufficient nutrients by spreading a 2- to 3-inch layer of plant-based organic matter or a 1-inch layer of well-composted manure over the surface. Work this in to a depth of 6 to 8 inches. Most sunflowers grown in a home garden are started from seed. To direct-sow outside, plant seeds 1 to 2 inches deep and 6 inches apart in the spring after the threat of frost in your area has passed and soil temperatures reach 55 to 60 degrees Fahrenheit. Cover the planting with netting until seeds germinate if birds begin scavenging them. You can also start sunflower seeds indoors. They don't recover well when transplanted, so start seeds in biodegradable containers you can just pop in the ground. After your plants have shown through the ground, start watering around the root zone. The roots are spread 3 to 4 inches away from the plant. Do not overwater, but ensure the roots are saturated to ensure deep rooting. Your small plants are susceptible to insects, snails and slugs at this stage. Consider added snail and slug bait near the stem to ward off pests and protect your plants. Feed sunflower plants sparingly. Excess fertilizer results in weak, leafy growth and few flowers. A slow-release fertilizer with a balanced N-P-K ratio, such as 14-14-14, applied once in midsummer works well. Scatter the fertilizer over the bed at a rate of 1/4 pound per 10 square feet, or as indicated on the packaging, and gently work it into the top 1 to 3 inches of soil. While your plants are being established, it is important that they get enough water. Depending on the size of your garden, several gallons of water may be needed. Water your growing sunflowers once a week. If it exceptionally dry, water twice a week. If it is consistently rainy, your plants will not need watering that week. Once established, sunflowers are very tolerant of drought. If you plan to harvest the edible seeds, though, watering the plants at the first sign of wilting encourages good seed development. In the absence of rain, water at least once a week to soak the soil and encourage deep root systems that keep plants from blowing over in the wind. When it comes time to cut your sunflowers for a bouquet, start early in the morning so that they do not wilt. They will live inside in warm water for about a week. For seed harvesting, the flower should have mature seeds 30 to 45 days after planting. The seeds will turn brown and dry. 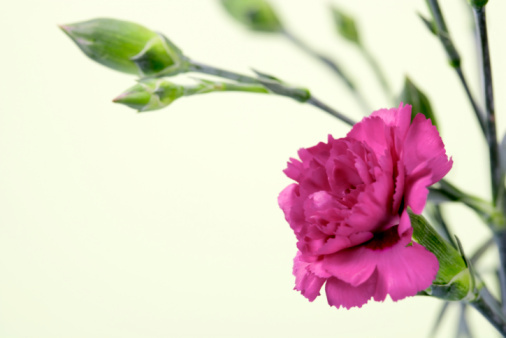 Remove the flower from the stem. Hanging the flower upside down until the seeds are completely dry ensures that they are ready. The seeds are removed best with fingers or a fork.